If you've got some extra cash and would like to help a local family celebrate the holidays, Jewel-Osco is partnering with two Uptown charities to make that happen. 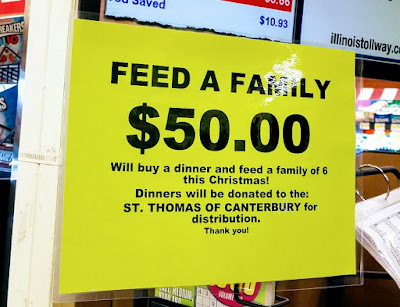 If you shop at Jewel at Montrose and Sheridan, you can support a family in need through the food pantry at St. Mary of the Lake. If you shop at the Broadway and Berwyn store, you can make a donation that goes to a family through the food pantry at St. Thomas of Canterbury. $50 will buy a meal for a family of six. Thanks to all who are able to contribute.